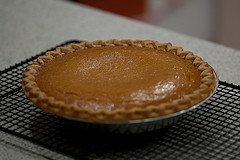 For anyone who is still craving pumpkin pie after Thanksgiving like I am, this recipe is for you. I don’t eat dessert very often, but always make an exception on the holidays. This year’s choices included blueberry, key lime, and pumpkin pie. All three were delicious, but the pumpkin pie stole the show in my mouth. Maybe there was something in that pumpkin pie because I can’t seem to stop thinking about. This isn’t a smoothie you’d likely consume on a regular basis, although fun to make once and a while to spice things up. Enjoy! Place all of the ingredients into your high speed blender and blend on high for 30-45 seconds or until desired consistency is reached. I’d really like to know how you liked this recipe; so please leave a comment below. OMG is all I can say, having just started with smothers yesterday I was looking for recipes that would kill my dessert cravings. Gonna try this one tonight..
Let me know how you like it, Nicole. Smoothies are a great substitute for otherwise unhealthy desserts. I used every ingredient to a tee, including the add-ons and after adding a little powdered stevia extract for extra sweetness and a few ice cubes to chill it up, this was delish! Beautiful, Gail. It’s the time of year for a pumpkin pie smoothie. Hi,I have all of the ingredients to make the pumpkin pie smoothie recipe but it is high in carbs and sugar and I would like to try to make it in my magic bullet blender and I know that it will put my blood sugar up a lot but I am curious about what this smoothie will taste like. It should be OK to drink this smoothie after I have a meal then drink it after my meal. This smoothie tastes like pumpkin pie :) Using unsweetened almond milk instead of raw milk will reduce sugar and carbs a fair amount. Maybe consume half if you still find it too rich. Hi,I will try this pumpkin pie recipe asap,I have a carton of cocoanut/almond milk,and the other ingredients to make this recipe and I will let you know how much I enjoy drinking this smoothie. Hi,I have enough of the ingredients to make this pumpkin pie smoothie,would the almond,cashew,and coconut milk be OK to use in this smoothie.I don’t have sea salt to put in this smoothie and I will make this smoothie soon.first I am going to make your vanilla thrilla smoothie on June 28 for lunch and then I will make your pumpkin pie smoothie for my mom and I to drink,and I will let you know how much we like your two smoothies. Yes, that milk would be fine to use, Kim. Enjoy! Hi,I am definitely going to make this pumpkin pie smoothie smoothie for my mom and I on June 30 after I have a light lunch,and I will immediately let you know how much we like and enjoy drinking your smoothie.I am still drinking the creamy avocado smoothie that my mom tasted and she doesn’t like it but I like drinking it. I am going to make your pumpkin pie smoothie this week and I will let you know how much I enjoy your smoothie soon.i am sick again,staying in the house until I am better,and so far I haven’t had to go into the hospital. Get well soon and enjoy the pumpkin pie smoothie, kim.